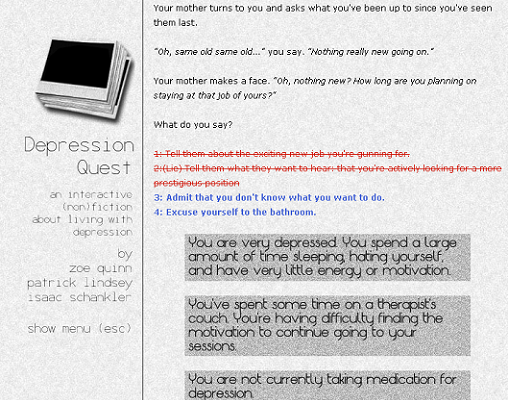 The recent #GamerGate events certainly attracted attention to Zoe Quinn and her game, Depression Quest. While I am a firm supporter of the movement, my curiosity was piqued. I’ve always liked CYOA books, and had encountered quite a few people online over the years who suffered from depression. So why not give this game a try. I looked into it and it turned out it was pretty short, too. Despite my relatively low expectations, at least I wouldn’t have to invest all that much time into it. Depression Quest is also free on Steam – so really the most one could lose trying it is 1-2 hours. 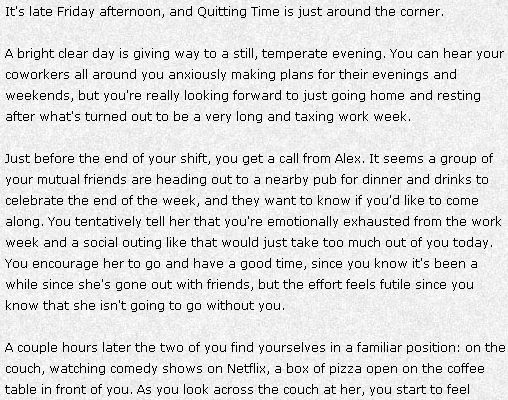 Depression Quest is indeed a very short, CYOA-style game. There isn’t much gameplay to speak of – like in the good old CYOA books, all you can do is pick between certain options you’re presented with, which directly affects the fate of your character. I clocked just over an hour in order to beat the game. And I don’t regret it. Having heard of the “crossed out” options due to the character’s depression, I thought the game would be constant downward spiral… But to my delight, I found out that the choice you make matter more than I expected, and it is possible to “win” the game by improving the character’s condition. The review contains mild spoilers (it’s an hour-long game), and is illustrated with my own screenshots. I gotta start with saying that your character in Depression Quest has a lot more going for him than lots of people with depression. Being in his 20s, he starts with a supportive (if not completely understanding) family, a full-time (if boring) job, and a kind girlfriend. The girlfriend, Alex, is probably my favourite character, she shows patience and dedication that few people in life have. Being a rather socially anxious person, the character has a much easier time talking to people online, and an online friend called “Attic” is someone he can talk to easily, and another person who cares. Yet, the feeling of worthlessness and lack of meaning in life increases and depression slowly creeps through, ruining your character’s life and draining his energy. It is never specified what exactly the job he’s working is, but it’s certainly nothing particularly creative, and is a big source of his negative feelings. In his spare time, he tries to work on a project that is also never concretely described – except that he is passionate about it. But, the worse his depression gets, the harder it is to get any work on it done. In any case, again, the character has much more going for him than most, and turning to those people who care about him for support can help greatly to improve. Make no mistake, the game is a CYOA, and thus closer to a book than a game, but doesn’t feature particularly great writing. Occasionally, there are some mistakes, like mentioning you’re taking depression medication when you’ve made the choice against it. Still, I feel the writing manages to get the point across well enough. Gameplay in Depression Quest is indeed scarce… The CYOA style of the game doesn’t leave much room for it. Whenever your character needs to make a decision, you are presented with certain choices on how he can act. 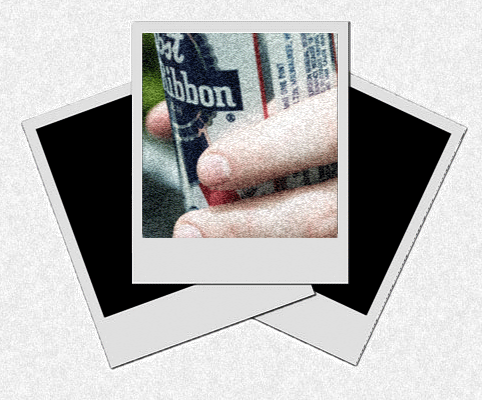 The quirk is that the worse your depression is, the more choices are crossed out – and, of course, they are the choices that make the most sense. This is a very strong way to convey the kind of downward spiral depression is – the worse your condition gets, the more irrational and suspicious of everything and everyone you become… This is probably the thing that impressed me the most in the game, along with the fact that there is hope after all – something I hope depressed people playing it can remember. I would say it is relatively easy to a rationally thinking person to get the character out of the hole… It’s often (though not always) crystal clear what choices can help the character shake off the negativity, and which ones will only drag him down further. Aside from the choices, another mechanic is an indicator at the bottom of the screen, which shows how bad your depression is, whether you’re seeing a therapist, and whether you’re taking medication. The first two are definitely connected – the better your depression gauge, the more you trust your therapist. Can’t say about the third, as I steered clear from medication – and the positive outcome I reached proves that drugs have alternatives… At least if you’re as lucky with supportive people around you as the character. While it is now on Steam, Depression Quest started off as a browser game, and that’s what it is, in essence (the Steam version simply uses Webkit). There are few visuals to speak of, again, it is mostly text, with just some blurry pictures vaguely depicting the particular situation the character is in. The music by Isaac Schankler is also nothing special – it is of course melancholic, but practically just a repeating set of piano chords. It is just quite repetitive and doesn’t add much to the game, but it’s not so bad as to detract, either. 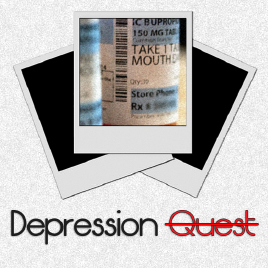 Many people would say Depression Quest could hardly be classified as a game, and they wouldn’t be completely wrong. But the fact that you make choices and the character’s fate depends on them is enough in my book. The game shows that even a person who seemingly has a lot going for him can get depressed, and see his life go down the drain in result… But it also shows that, if you have people around you willing to help, you can overcome it. This is far more than can be said for many depressed people in “real life”… If you’ve got no-one to really rely on, it is much, much more difficult, and it is very easy to imagine what the character’s life would be like without Alex, his brother Malcolm, or even the online friend Attic… It would be near impossible to get off the downward spiral. I truly hope the game can help people with depression see that there is light at the end of the tunnel after all. And even for people who are not suffering from depression, it can be a source of enlightenment, despite the rather mediocre writing. One thing I can say for sure – it does invoke feelings in the reader, I know I felt happy when I managed to get my character out of the hole – even if another part of the message was that even if you overcome depression, it could always come back at a later point. 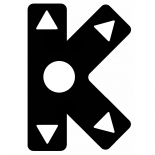 At the end, I feel that this game deserves a shot if you have any interest in the issue of depression.